Since October 1, the decline in growth stocks has stolen the show. 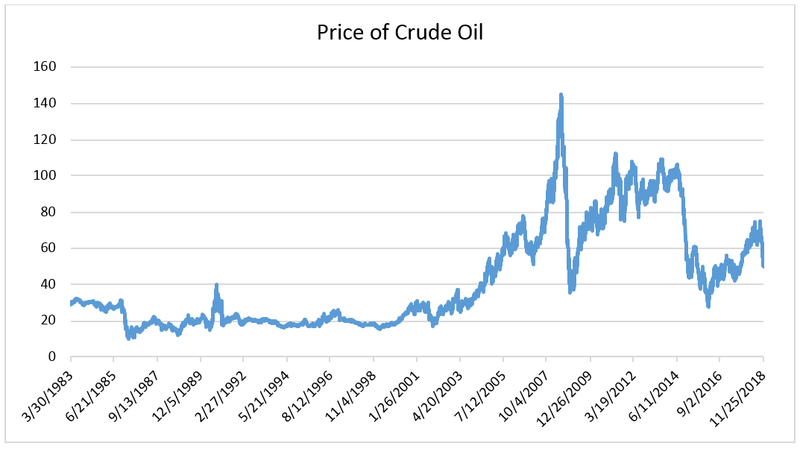 However, there’s been another part of the market that’s suffered just as much: oil. As of Monday, the price of crude oil has dropped by 32% in just 62 days. That’s one of the sharpest drops in the past 35 years. Like anything else, the price of oil is driven by supply and demand. When there’s more oil than people want, the price drops. And this sudden collapse is due to the recent spike in the supply of oil. As of November 28, that oversupply has lasted for 10 weeks, the longest such streak since April 2015. 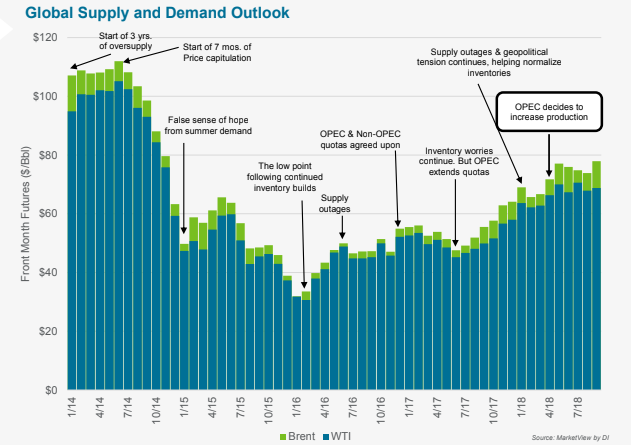 As you can see in the chart below, this is part of a long stretch of time where there’s been an overall oversupply of oil. The chart ends in September 2018, which is before the recent decline. But overall this trend has resulted in the price of oil being cut in half since the beginning of 2014. Although the United States has been a huge player in the oil industry over the past few years, OPEC is still the main driving force behind the price. Overall, about 33% of the world’s oil supply comes from OPEC countries. So, its decision to increase production back in April had some weight to it, and oil prices topped out a couple months later. Since then, OPEC’s production has gone up by more than 700,000 barrels of oil per day, which was enough to push it above current demand levels. But now, production is expected to come back down. We’ll know more after the OPEC meeting on Thursday. But the expectation is that it could cut production by 1 million barrels per day or more. If that happens, the price of oil would rebound. That’d be a great time to buy an oil exchange-traded fund like the SPDR S&P Oil & Gas Exploration & Production ETF (NYSE: XOP). Or if you want the chance at a higher return, you could buy the ProShares Ultra Bloomberg Crude Oil ETF (NYSE: UCO). UCO provides twice the return of oil. So when oil goes up, you get a higher return. However, it also goes down twice as fast. So, XOP is a more conservative play, while UCO is a high-risk/high-reward trade.